Observing the night sky from Suburban or Urban environments is always a challenge - artificial lights and the ambient sky glow associated with them tend to mask the finer details in popular Deep Sky targets and completely obscure the view of some objects which would be readily observable in telescopes in darker environments. This is where the Explore Scientific 1.25" CLS Nebula Filter comes in. Standing for "City Light Suppression", the Explore Scientific 1.25" CLS Nebula Filter is not just for observing nebulous objects, as it lets a broader swathe of wavelengths through to the observer than either the OIII or UHC Explore Scientific filters do. This means that observation of some galaxies and star clusters benefit from this filter, in a way that they would not when using either of the aforementioned OIII or UHC filters. This filter is threaded for use with most 1.25" eyepieces and accessories with a suitable female thread. The CLS filter is also a useful imaging filter, particularly in this its 2" guise, which allows for illumination of virtually all of a standard 4/3rds DSLR chip. However, this 1.25" version is more useful for smaller CCD imagers with 1.25" nosepieces and chips of 1/2"-3/4". Blocking a good deal of light pollution and letting through useful wavelengths leads to more neutral background skies and easier to deal with gradients when it comes to post processing of digital images. Although, it should be noted that image exposure times will have to be increased in order to gain the best results from this filter. As with the entire Explore Scientific range, this filter comes with a unique serial number and matching test certificate. 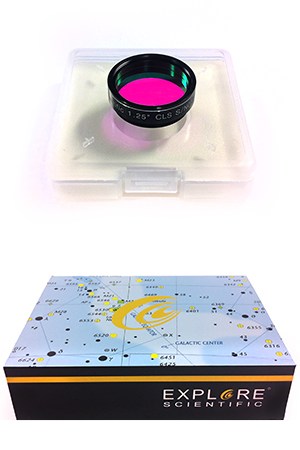 The Explore Scientific 1.25" CLS Nebula Filter also comes in an attractive presentation box and plastic air tight carry case for protection of the filter when transporting and storing it.